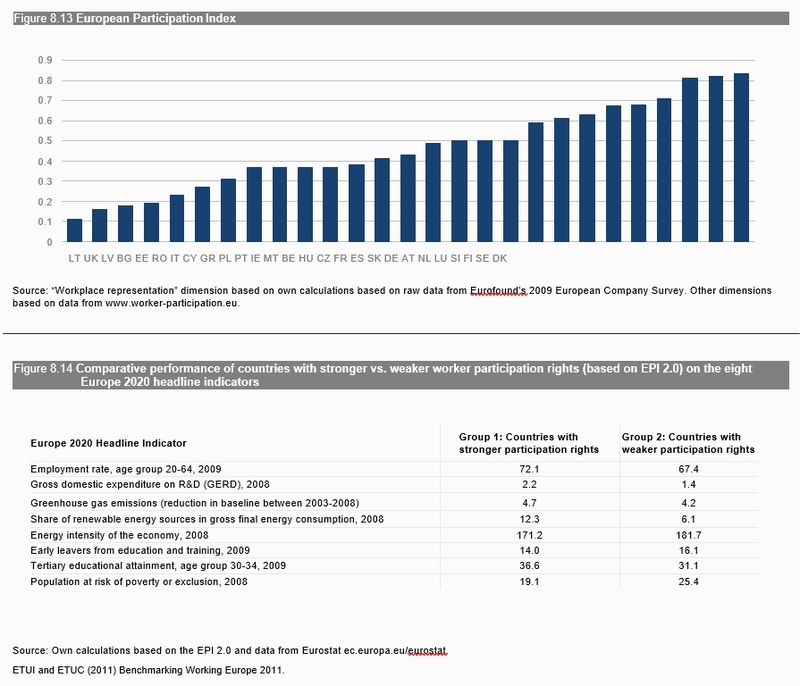 In order to measure the extent of worker participation in different European countries researchers at the ETUI have developed the EPI (European Participation Index). This is a composite index which summarizes both formal rights and the extent of participation on three levels: in the board, at the establishment level and through collective bargaining. Establishment-level participation – measures the strength of worker participation at the plant level. This is based on an analysis of Eurofound’s 2009 European Company Survey, which includes data on the presence or absence of formal employee representation in more than 27,000 companies in the EU27 and other European countries. Collective bargaining participation – measures union influence on company industrial-relations policies, including an average of i) union density (i.e. percentage of workforce belonging to unions) and ii) collective bargaining coverage (i.e. percentage of the workforce covered by collective agreements). What kinds of institution and arrange- ment are helpful in improving economic, employment, social and environmental performance, such as those included in the EU2020 strategy?